Many Baker-Nunn cameras were built during the 1960's to capture film images of artificial satellites. The camera optics were designed by Mr. James Baker and Mr. Joseph Nunn, hence the name "Baker-Nunn Camera". The original mounting provided 3-axis of motion and by a complicated system of motors and differentials was capable of tracking artificial satellites. The images were captured on a continuous roll of film with a transport mechanism that drove the film across the curved focal plane within the Optical Tube Assembly (OTA). The film transport mechanism was very complex to allow different exposure times and to move the film in and out of the focal plane while maintaining a light tight environment. The University of Calgary acquired one of these Baker-Nunn cameras and decided to modernize it and put it to work searching for asteroids and other astronomical objects. The University staff modified the 3-axis mounting into an equatorial fork mount using the original primary gearing. DFM Engineering was contracted to provide new secondary gearing and a retrofit TCS based upon DFM's latest Windows version of their TCS. Special provisions were made throughout the entire project for operation in the cold weather Canadian climate. A very interesting part of the project was replacing the photographic film with a modern large format CCD detector. The CCD detector, while smaller than the format of the film, is much more sensitive and has a wider dynamic range than film. One major problem with the Baker-Nunn camera optics is that they produce a curved focal plane. The film could be bent around the focal plane curvature, but the flat CCD cannot be curved so a field flattener operating at F/1 was needed. 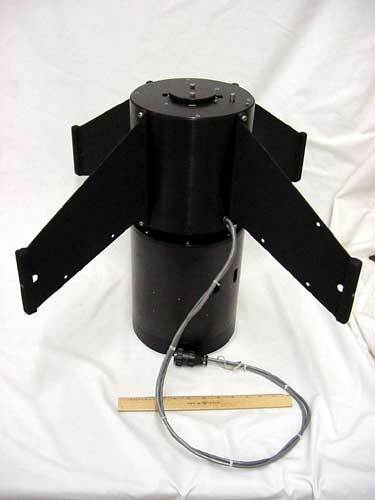 Dr. Malcolm MacFarlane designed a two element field flattener for the Baker-Nunn. Dr. MacFarlane has previously worked with DFM Engineering on field correctors/field flatteners and the design of the US Naval Observatory's wide field 1.3-m DFM telescope. The first element of the field flattener is a steep meniscus and is located substantially in front of the focal plane. The second element is located just in front of the CCD focal plane and was built into the CCD camera housing. DFM Engineering was tasked with integrating the entire prime focus instrument including the lens cell for the first element of the field flattener. The cooled 4K x 4K CCD camera, its housing, and the second field flattener lens cell were contracted to a commercial camera manufacturer by the University. DFM designed and fabricated the other components. The prime focus instrument consists of spyder vanes, a focus housing, the CCD camera housing, a large format shutter, and the lens cell for the first field flattener element. The entire assembly had to fit into the available space and place the CCD focal plane and the field flattener lens elements at the proper optical spacings. DFM Engineering worked with the camera and optical manufacturers to coordinate the various components and maintain the critical optical spacings. The spyder vanes were custom designed to just fit into the space available immediately behind the last surface of the camera corrector lens element. Tip/tilt and centering adjustments were built into the spyder vanes where they attach to the original OTA structure and still maintain the original Invar spacers used to control the focus shift due to temperature changes. The space available for the focus housing required redesign of the standard DFM 20/24-inch telescope focus housing to reduce its length. The weight of the prime focus instrument including the CCD camera, the first field flattening lens element, and the custom designed shutter was substantially greater than the weight of a secondary mirror. The increased load required some additional changes to the focus housing. The focus housing is motor driven and includes a very accurate focus position encoding system. The motor drive controls and the focus position readout are performed by the TCS. Collimation (optical alignment) of the system is very critical due to the F/1 focal ratio optics. Presently, the collimation is very good, but some additional work may improve the images. 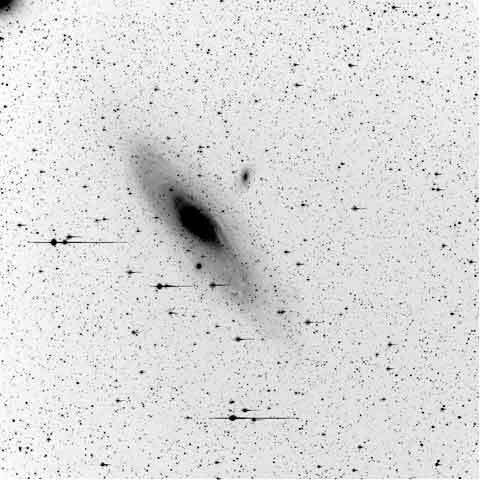 The raw data image of Andromeda is a 1 minute integration and reaches about 17th magnitude. The field is about 4 degrees square.